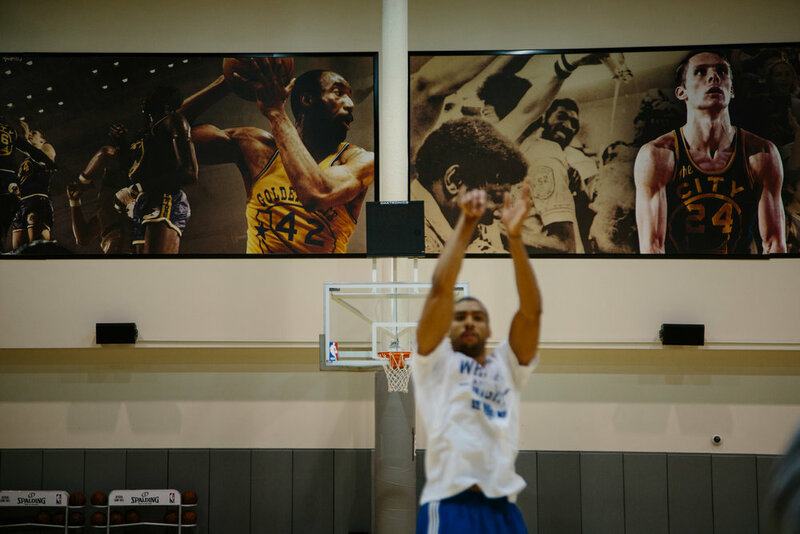 For a story shot for The New York Times on James Michael McAdoo, the last man on the Golden State Warriors' bench. Captions appear on hover. Published story here. James Michael Ray McAdoo heads to the gym to stretch and digest before starting practice. He is the first to arrive, which is the norm for McAdoo. McAdoo stretches and digests in the gym before starting to practice. He is the first to arrive, which is the norm for McAdoo. McAdoo practices in the gym with Khalid Robinson (video intern, right) and Luke Loucks (video intern, left). McAdoo practices in the gym. McAdoo waves hello to parking attendants as he arrives at Oracle Arena in Oakland to workout and warmup for a home game for the Warriors. McAdoo warms up before a Warriors home game. In the background, the Warriors dancers practice their dance routine. McAdoo is often the first one on the court warming up; he is so early that technicians are still finishing setting up pyrotechnics and dancers are rehearsing on the court at the same time. McAdoo does strength training and cardio in the locker room prior to a Warriors home game against the Cleveland Cavaliers. McAdoo watches the Warriors home game against the Cleveland Cavaliers from the bench, high-fiving his teammate Klay Thompson. A video of McAdoo speaking about what MLK Jr. Day means to him is part of a video compiliation being shown on the Jumbotron during the game in honor of MLK Jr. Day. McAdoo plays during a home game against the Cleveland Cavaliers. McAdoo poses for a portrait in his backyard.